We invite you to stay at our hotel with a refreshing pool in any of our 15 rooms with AC. Our beautifully is placed hotel right on the mountains near the city of Ouarzazate in a oasis village called Fint. Here you can rest and feel the serene and pleasant lethargy of the Oasis. Away from the urban ambiance Ouarzazate is known for, this way you can escape from it and be amid the oasis surrounded by tall palm trees and filled with delicious dates. We offer excellent tours in 4×4 with a guide around the Ouarzazate region, to the Draa Valley and Canyons, to the Sahara desert and many trekking routes, biking trails and donkey ride in the Fint oasis and to the nearby Berber villages. We recommend that you take this opportunity to eat with the local Berber tribes and taste their delicious mint tea. 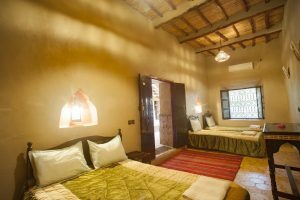 This Hotel also organizes activities for typical Moroccan cuisine, Arabic and Berber language courses, henna tattoos and pottery workshops with the local Fint artisans. We also can take you to the local bakery where you can learn with the village women to bake bread on the community ovens. We offer great views and traditions Berber living. You’ll be able to cruise around in the villages around Fint Oasis. The Berber identity was born and is most active in South. An escapade that takes you to the real Berber living and away from the European style cities of the north. La Terrace des Délices is a small familiar hotel with a big refreshing pool. It’s located right on the edge of the mountains viewing the amazing Fint Oasis. Fint is just 15km from Ouarzazate and stands for a great alternative to the big hotels found in the city. This way you can enjoy both environments. Our Hotel has 13 rooms all traditionally decorated. Our Hotel views are the best in the area and we invite you to spend a few with us, drinking tea, enjoying the sun the quietness and impressive landscapes.